Ordinarily, players work a video-game console that includes several buttons and joysticks. Other games use a computer keyboard and mouse. The player controls the movements and, above, all, the decisions of the main character or avatar, the player’s alter ego. For example, in the Assassin’s Creed series, which includes several related games sold by Ubisoft Entertainment (where May works), the main character, Desmond Miles, pursues an adventurous quest to find several artifacts (“Pieces of Eden”) that embody extraordinary powers and may even save humanity from eradication by a solar flare. The player determines how Desmond moves through the game’s landscapes—running, climbing trees or buildings, hiding in rooms, or leaping across roofs. Production on a video game resembles that for a computer-graphics film. But interactivity demands far more content than a movie. Screenwriting provides an instructive comparison: screenplays average 120 pages and may take years to craft, but a videogame script can be 1,000 pages long, with the writing team cranking it out in three to six months. 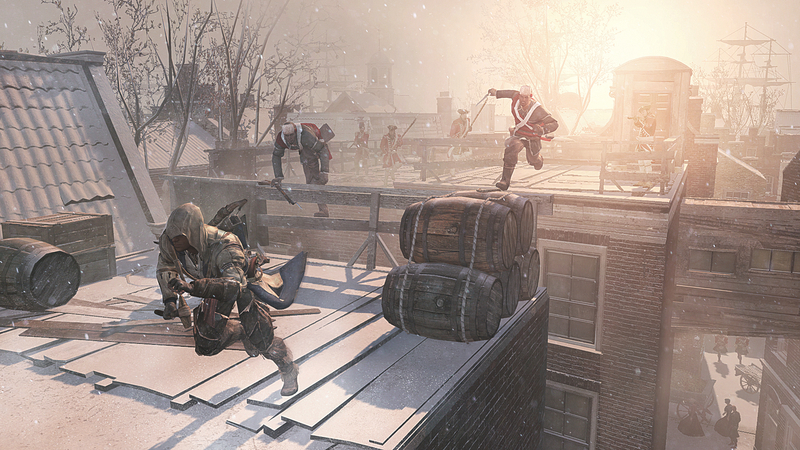 Assassin’s Creed III had seven credited writers. May wrote the game’s “main path,” which means, he says, “the things you [the player] have to do,” while colleagues knocked out “side missions,” onscreen text, and artificial intelligence (AI) lines, which enable reactions to the player’s choices. Games are built with “engines,” collections of tools that include foundational code and systems to determine things like how to render graphics and manage AI. For example, an engine might enable building a “first-person shooter,” a game in which the player tries to shoot enemies while seeing the landscape through the eyes of the avatar. (Call of Duty, now the top-selling video game for several years, is a “military shooter.”) A different engine might support a sports game, like football. Some engines are versatile: Ubisoft has deployed the Assassin’s Creed engine to make other games as well.